5 Minute 5 Ingredient Chocolate Pecan Fudge is a creamy chocolate fudge generously filled with pecans. 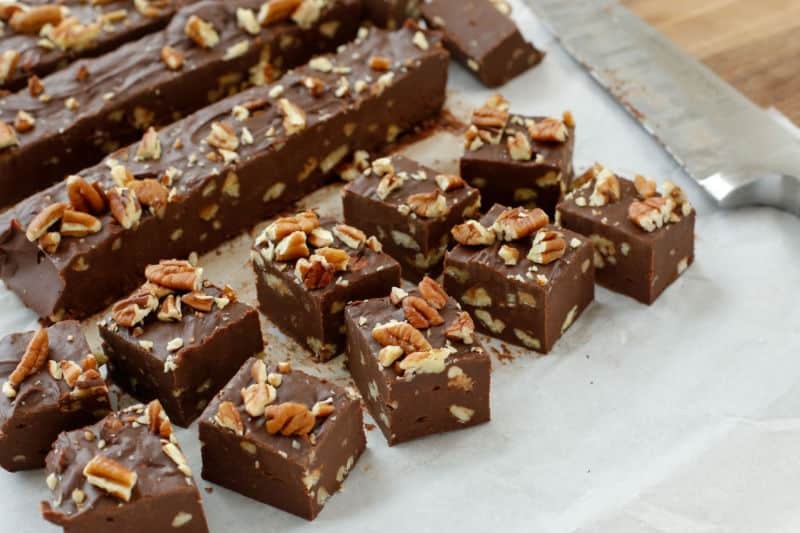 This Chocolate Pecan Fudge comes together in just a few minutes and it is perfect for gifting, snacking, and serving for any occasion. 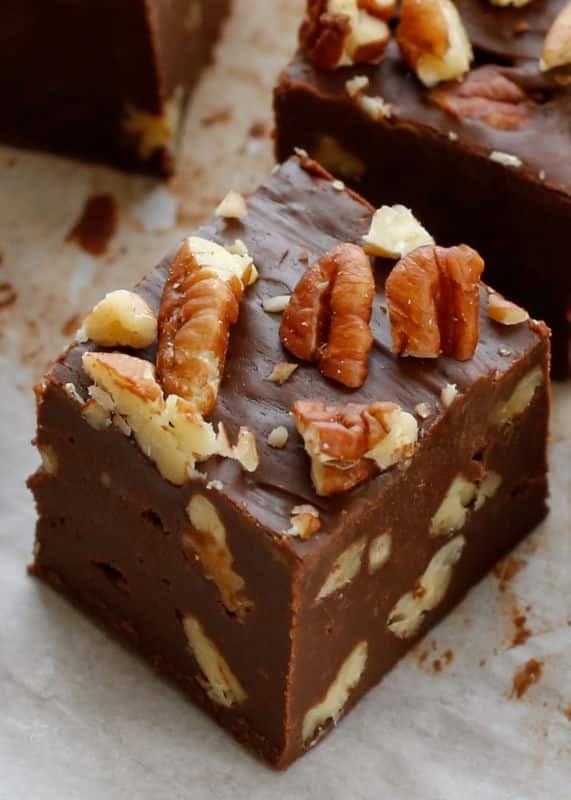 Made with or without nuts, this fudge is a staple on our dessert tables throughout the holiday season. Traditional old-fashioned fudge is a time intensive and finicky candy to make. Old fashioned fudge requires a candy thermometer and a considerable amount of time spent stirring the hot mixture over the stovetop. Now, I’m thrilled to be making countless varieties of fudge in just minutes. I’ll be sharing a new fudge recipe each week throughout the holiday season. This is the first of many EASY FUDGE RECIPES to kick off our holiday baking and gifting season. While I’m not really a fan of microwave cooking in general, nothing beats being able to melt baking ingredients to the perfect consistency in just moments. 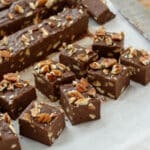 To make this Chocolate Pecan Fudge, you simply combine everything in a glass bowl, heat for a couple minutes, pour onto a tray, and refrigerate until firm. However, if you don’t happen to be a fan of the microwave, you can easily melt the chocolate, milk, and butter in a double boiler on the stove top. It will just take a few minutes longer. If you’re looking for more great fudge recipes, you’ll want to check out our top three fudge recipes: White Chocolate Caramel Fudge, Buckeye Fudge, and Creamy Peanut Butter Fudge. The Creamy Peanut Butter Fudge has been an enormous hit with every single person who has made it. Nothing beats having candy recipes at your fingertips that only require a handful of ingredients and a few minutes time. Butterscotch Fudge and Caramel Peanut Butter Pretzel Fudge are both on my list to try this year. PLEASE NOTE: This recipe calls for sweetened condensed milk, not evaporated milk, not heavy cream, not half and half, nothing else will work. Trust me on this. Kitchen Tip: I use this bowl, this spatula, and this pan to make this recipe. Add the extract and stir until smooth. Stir in 1 cup of pecans. Scoop into a parchment lined loaf pan. Spread with a spatula to approximately 1-inch thickness. Top with remaining chopped pecans. Chill until ready to serve. Slice into 1-inch squares and store in an airtight container in the refrigerator for up to a week. Creamy chocolate fudge that you can make in just a few minutes! If you aren't a fan of the microwave, you can easily melt the chocolate, milk and butter in a double boiler on the stove top. Cooked mine on top of stove. It tasted wonderful , but did not get firm. How long should I have cooked it on top of stove😔?? The cooking time shouldn't affect whether or not it sets. Chilling in the fridge should have resulted in fudge firm enough to slice. Did you use sweetened condensed milk? The most common error is accidentally using evaporated milk. WOW! Thank you so very much! This fudge recipe was quick, fast and scrumptious. I am a Missionary Minister to the Confined Elderly and they love fudge. I am going to surprise them with this very easy and delicious. Thanks again and Have a Happy Valentine Day. I'm thrilled that you love the fudge recipe! Thanks for taking the time to tell me. Can you use milk chocolate chips? I think that will work fine, however, I haven't tested it myself. If you do try it that way, let us know how it works! I made this for my hubby for Valentine's day. This was my first attempt at making fudge, and I'm 56 years old lol. I must say, it was super tasty and easy and fast. It tended to stay a bit soft, but once it firmed up fair in the fridge, I separated the pieces a bit & it dried out some, firming it. Truly yummy and I'm proud of myself! Thanks for the recipe! I'm so happy you liked the fudge, Jessica! The flavor was excellent! But it would not firm up no matter how long I left it in the fridge. I did everything 100% according to the recipe. Any ideas on how to firm it up? The most common error is to use evaporated milk instead of condensed milk. I have never had it stay soft after refrigeration when made with the above ingredients. This was a really good project. I would recommend this for anybody wanting to bake an easy treat with their family. I'm glad you enjoyed the fudge! The flavor is fabulous. It does seem to be a softer set than some other recipes I have tried. However those were the long and strong stovetop recipes. I like this easy recipe and it's flexibility. I'm so glad you like the fudge! I think this needs a bit less of the sweetened condensed milk or a bit more chocolate chips. It’s a bit more like super thick frosting than fudge.